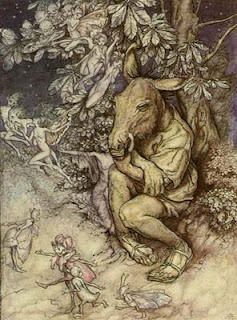 Traditionally, Shakespeare’s Midsummer Night’s Dream was always produced with lots of children as the fairies. (Since Peter Brooks’ famous Stratford-upon-Avon production, in 1970, theater companies around the world have gotten farther and farther away from that traditional Midsummer.) Benjamin Britten, who loved working with kids, wrote an extremely challenging and important role for children’s chorus in his Midsummer opera. Britten was himself both a child prodigy and a gifted teacher, and he understood this fundamental law of music-making: young people rise to the challenge. That is, unless an adult says “This music is way too hard, kids will never be able to sing or perform it”, the kids will probably just go about the business of singing or performing it to the best of their ability. They don’t know it’s too hard! With that philosophy, Britten was able to get amazing things out of young musicians, and to this day his students are leaders in the musical life of Great Britain and the world. Through this palace, with sweet peace. Above, the final benediction as seen recently at Houston Grand Opera. Seattle Opera’s children’s chorus is prepared by our Chorusmaster, Beth Kirchoff. 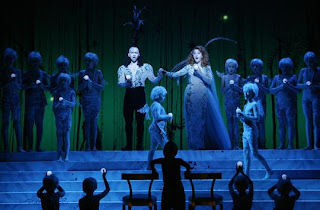 The eight children singing in A Midsummer Night’s Dream range in age from 9 to 13 years old. They include accomplished string players as well as singers. One of our kids has appeared with 5th Avenue (Whistle Down the Wind); one was a supernumerary on Seattle Opera's mainstage; and one was recently featured in his school's performance of our previous Young Artists production, Siegfried and the Ring of Fire.